Huntington Beach native and Anaheim Jr. Ducks graduate Troy Loggins has been named the WCHA Co-Offensive Player of the Week. Loggins lifted No. 16 Northern Michigan into the 2018 WCHA championship with the game-winning, overtime goal in the decisive Game 3 of the Wildcats’ semifinal-round series against Bowling Green. In a situation where the next goal would extend one team’s season and end it for the other, Loggins scored 15:53 into the sudden-death overtime to give NMU a 3-2 victory. The junior tied for the league lead during the WCHA semifinals with two goals and three points, while posting a conference-best 19 shots on goal. 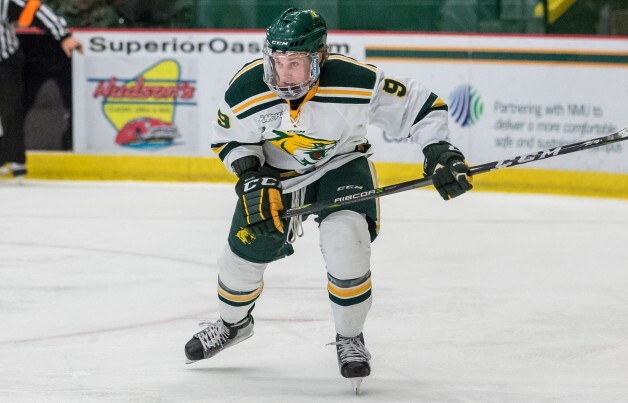 Loggins had a two-point effort in the Wildcats’ 6-1 Game 1 victory, tying the contest 1-1 with a first-period, power-play marker, then assisting on NMU’s third goal. This is Loggins’ second consecutive WCHA weekly award and third career honor, with all three coming this season (also on Jan. 15. ).